I had a brilliant day being Ben & Amy’s Rivington Hall Barn Wedding Photographer. The day started with bridal preparations in a near by hotel, where luckily Ben and his ushers were also getting ready. 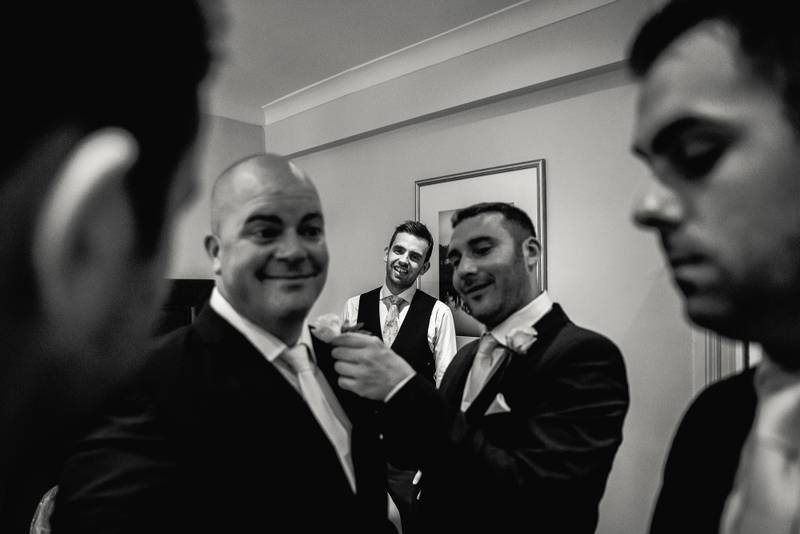 This meant I could photograph both the boys and the girls getting ready, Ben and his 8 groomsmen getting ready in a small hotel room was a bit of a squeeze. I loved the different atmospheres in both rooms as everyone got ready a few doors away from each other. 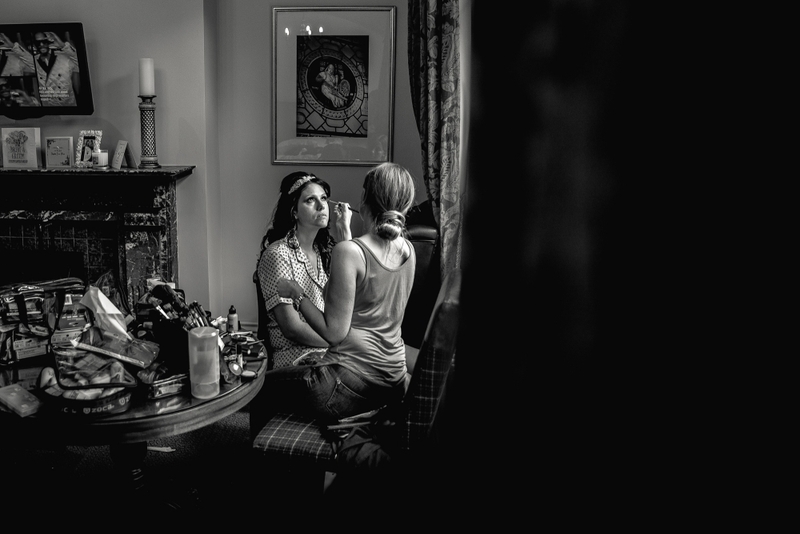 I left to photograph their Rivington Hall Barn Wedding shortly after the boys, leaving Amy and her Bridesmaids to finish off preparations and make their way to the ceremony. I arrived at Rivington hall just as the guests were arriving, being greeted by Ben and his Ushers the atmosphere was calm and relaxed.. and then we waited. Anxiety started to kick in for Ben when 20 minutes after the ceremony was due to start, the bridesmaids still hadn’t arrived, in the car that still had to go back and pick Amy and her Dad up. Frantic phone calls were being made to find out where Amy and her bridesmaid were, especially when the registrar’s who had another wedding to attend said they could wait no longer and have to leave. We were all thinking the unthinkable, the ceremony might not happen. As soon as the bridesmaid’s arrived the car headed back for Amy, but there was never going to be enough time, the hotel manager coming to the rescue, dropping Amy off just as the registrar’s were getting ready to leave. The rest of the day was completely stress free, lovely blue skies, with a drinks reception on the outdoor patio area. As Amy and Ben’s Rivington Hall Barn Wedding Photographer I was able to capture really natural images of their day in the stunning surroundings of this Lancashire venue. If you are looking for a Rivington Hall Barn Wedding Photographer who shoots in a relaxed, natural way please get in touch to discuss your day more.